Almost four years ago I started Girl Loves Gloss because makeup and beauty was and is my favourite thing. I’ve been passionate about beauty since I was a young girl, and have an ever growing makeup collection to prove it. Along the way, I started to communicate with brands, PR/Marketing Coordinators and samples started to arrive on my desk. Here’s how I did it. Now while I never got into blogging to get “free stuff” (side note: that sounds so cringe), it is a huge part of the blogging business. Press samples help me try and share products with you all that I would possibly never get the chance to. Sali Hughes has said that gifted product is vital to a balanced and unbiased beauty blog and I couldn’t agree more. Purchasing a product personally connects you to that item, and you’re only going to purchase something that appeals to you. The magic of discovering a diamond in the rough, or a product you normally wouldn’t look twice at (see my Surprising Products of 2016 post) becomes plausible with press samples. So how do you get press samples? Occasionally brands or PR people will reach out to me. They might ask if I would like to try new lines they represent, new launches or just a sampling of bestsellers to allow me to get a feel for the company. The larger your blog grows, the more this will happen organically, but what about when you’re just starting out or want to reach out to certain brands to get the ball rolling? It seems simple, but your blog layout could be hindering you. A new reader (and potential brand collaboration) should be able to contact you and connect on social media within the first 30 seconds of landing on your website. While you’re at it, make sure there is some sort of representation of who you are at first glance (PR and brands often want to know if you’re writing solely or if it’s collaborative with multiple writers); A picture of yourself somewhere, be it the home page or on an about page, or both, helps connect you to your audience. Is the quality of your photography good enough to be featured by a brand on Instagram? Put your own spin on layouts and styling and look up tutorials on youtube about photography and editing. You’ll want your photography to look as professional as possible for your blog. You want a brand or PR/marketing coordinator to want their products on your blog. Nothing says, “Hey, I love your products and would love to work with you!” more than linking to posts on your blog/social media where you’ve already featured them. Tag brands in social posts so you can get seen! When contacting a brand I am sure to mention any links to posts that have received a great response featuring their products. I especially make a point to do it if the brand has reposted the image to their account; It establishes there is already a relationship there. Don’t go overboard with this; No PR person is going to want to look at 10 links you send them (they don’t have time and will just move on) so keep it to one or two. Once you’re ready to approach a brand, be prepared they could ask for stats. By this point, you should have Google Analytics installed on your blog and have had at least several months of monitoring your visitors and demographics. If you’ve not installed GA yet, Here’s how. You’ll want to know what your monthly views are, and how many unique visitors you get each month. In my experience, not many brands ask for stats right away but have them ready just in case. Don’t get wrapped up in numbers and comparing yourself to other blogs. It’s your connection with your readers that with either appeal or not appeal to a brand or PR person. Also, don’t attach a media kit in your initial email to a brand or PR person; Emails with attachments might go straight to their spam filter. So you want to try a specific brand out. Why? Is it because they are a green beauty company? Do they have a new innovative launch? Does their seasonal collection speak to you? Get together a focus for your email and pitch it to the PR person or brand you contact. Cold emailing with a simple, “Hi I write a beauty blog, could you send me some products to review? Here’s my address, please add me to your mailing list” won’t win you any awards for standing out in a very large, crowded blogging industry. Instead, mention that you’re interested in trying them out because of their cruelty-free stance, or unique shade range for example. 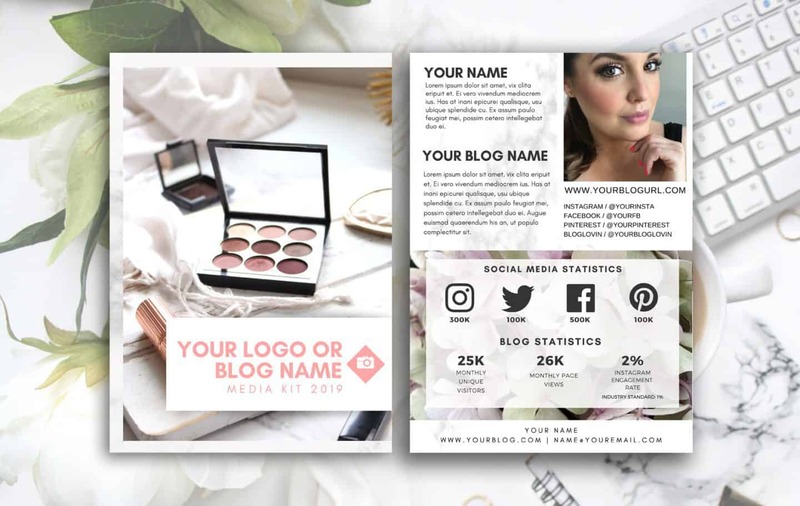 Ask if press samples are available so that you can feature the brand in the story idea you have. Connecting like this can open doors of communication up down the road; The next time there is a seasonal launch from that brand you can follow up, letting them know you want to continue to work together. Ask to be added to their media list to be kept in mind for future launches. So you’ve made contact, now what? Now, my friend, you wait. It can be tempting to want to follow up several days after no response (hey, it is 2017 after all – doesn’t everyone respond to emails asap?). I urge you to wait at least two weeks. The public relations world is constant hustle and bustle and these folks are BUSY. After two weeks, email a short follow up. Let the brand know you’re still interested in working together. After that, leave it and revisit in a couple of months. When you get a response you might get offered some products of their choosing or a specific launch. Remember that this is not a shopping list of all the products that have ever been on your wishlist. Think about products that your readers are interested in reading about. Also incredibly important: Take note of any embargoes or posting restrictions a brand might put forward. If they say you can’t mention a product before a certain date, DON’T. It’s a surefire way not to work with that company again if you do. Finally, a brand might offer to send you product but under a set list of conditions. For example, if they request to read a draft of your post before it goes live, want you to photograph items shown with other products from the brand only, or want you to post on a specific date. This is when You offer to send them your rate sheet for sponsored work. I hope this helps demystify the world of PR samples and clarifies the etiquette involved in contacting a brand. Remember, it can’t hurt to ask and all they can say is no! If this helped you please leave a comment below. Join in the discussion if you have any tips or tricks for working with brands! Previous Post Excessive Lashes and Dramatic Volume? Yes Please!